Clients – Motion Analysis – Nytric Ltd.
Motion Analysis Corporation (MAC) is one of the world’s largest manufacturers of high performance optical instrumentation systems that measure and track the movement of objects. The systems evaluate motion in a wide variety of applications: Animation Production, Movement Analysis, and Industrial Measurement & Control. 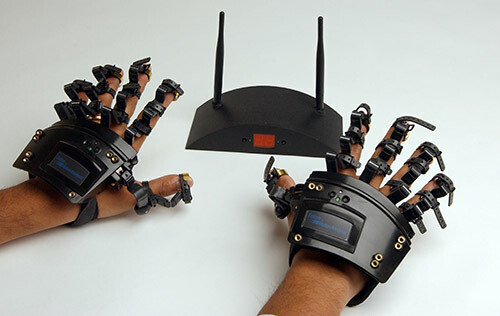 MAC approached Nytric to develop an advanced data glove with some very demanding specifications. Not only did the product need to accurately measure finger bend movements but also measure finger ad/ abduction, the full range of thumb bends and motions, and had to be extremely lightweight. It also has an extended wireless range, long battery life and is easily cleaned. With one size fitting almost any hand, and a rechargeable battery, this is one of the most advance data gloves available today. Nytric ensured the product was designed to RoHS compliancy and saw the product through FCC and other regulatory testing.